In a real-time operations tracking system, it is not sufficient too track inventory at a location or even to track individual containers using license-plate tracking methods. It is also important to track nested containers. Here, as shown in this example for the US Department of Defense, we have individually barcoded circuit boards with their own license-plate tracking barcodes. These are placed in cartons, which have their own license-plate tracking barcodes. These cartons are then placed on pallets, which have their own license-plate tracking barcodes. Inside BellHawk, these are recorded in the Containers table, with a parent-child relationship, as shown here. There can be multiple layers of nested parent-child relationships, in our example, records for the circuit cards having their carton as a parent container record, each of which has the pallet as a parent container record. The first benefit of this is that if a pallet is moved, picked, or shipped then it is not necessary to break-down the pallet and scan each circuit card to record the activity. All that is necessary is to scan the pallet barcode. The system knows what is on the pallet and can use this data to generate ASN (Advanced Shipment Notice) data, for delivery by EDI software, describing the nested relationship of all the containers and materials on the pallet. This ASN data can then be sent to a recipient (by EDI software) who will use the information to receive the contents of the pallet simply by scanning the tracking barcode on the pallet. Another advantage is that cartons can be removed from the pallet and materials removed from the cartons and BellHawk still knows what materials are on the pallet and where the carton now is and which items it still contains, which is necessary for efficient operations tracking and management. BellHawk also tracks untagged materials directly at locations without these being in containers. Untagged items have no license-plate tracking barcodes on them. Untagged materials might be a pile of sand on the floor or a stack of boxes (without license-plate tracking barcodes) on a shelf. As we might have multiple untagged items at a location with different item numbers, lot numbers, and attributes such as size and color, we have to track them separately. To do this we use the concept of virtual containers, which are tracked the same as real containers except that they do not have tracking barcodes; instead they have internal reference numbers. BellHawk also has the concept of single use (Type 1) and multi-use (Type 2) containers. 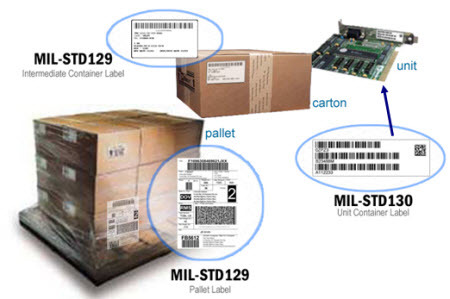 Individually barcoded items, real and virtual containers with a single part number, lot number and other attributes the same are considered to be in type 1 containers. 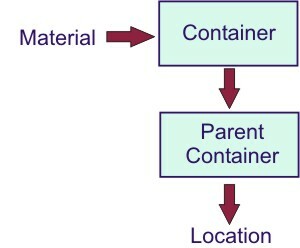 Type 2 containers are the parent containers. A type 2 container, such as shipping pallet can have multiple untagged items, plus items in boxes with their own tracking barcodes, on the pallet In the BellHawk containers table, these are flagged as type 1 and type 2 container records. Also physical containers, such as boxes, bins, totes, and pallets can be identified as type 1 and type 2, as a way of preventing mixing of unlike parts together or of mixing parts that belong to different customers or projects. Please click on the following link to return to " How BellHawk Tracks Inventory".